Al-Qaeda killed thousands in its attack on the World Trade Center, but their 'hearts bled' over last week's Pakistan massacre. Al-Qaeda on Sunday slammed the Taliban for being “too violent,” as the heads of the international terrorist group lectured the Afghani Islamists over their killing of nearly 150 schoolchildren last week. A spokesperson for the he al Qaeda in the Indian Subcontinent (AQIS) group said that the "massacre of innocent children" in an Afghan school last week makes "our hearts burst. O rulers, O people in power, if you will commit such acts, there will be a reaction," the spokesperson said. 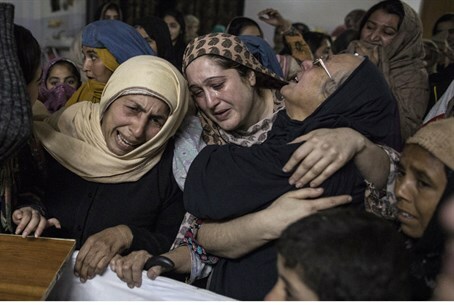 "The fighters of al Qaeda in the Indian Subcontinent condole the death of these children,” the spokesperson said. “Our target is not innocent civilians, women and children, instead we are responsible for their protection." The bloody attack by Taliban terrorists on a Peshawar school in Pakistan on Tuesday left nearly 150 people dead, 132 of them children and another nine staff members according to officials, in the largest attack in years in the country. Pakistani army spokesperson Asim Bajwa said in a news conference that seven Taliban terrorists committed the attack on Army Public School and Degree College, and that all seven wore bomb vests. Over 100 other people at the school were wounded, most of them children and many having been shot numerous times. Pakistan had been holding reconciliation talks with the Pakistani Taliban up till last spring, with the country criticizing America for drone strikes on terrorists and warning they could upset the talks. Those talks have since gone south amid a string of Taliban attacks and pressure on the government to crack down on the terrorism.